One handy thing about using our bias tee enabled RTL-SDR dongles is that you can easily power a remote LNA, such as Adam’s LNA4ALL. The bias tee sends DC power down the coax cable eliminating the need for a remote power supply. However, in our current iteration of the dongle the bias tee must be soldered on via a jumper, and once soldered it is permanently providing DC power down the coax cable. This is fine if you are always using a LNA, but if you want to one day remove the LNA and use a shorted antenna, you cannot. A shorted antenna is an antenna designed with the center and shield of the coax connected together creating a DC short (e.g. J-pole and QFH antennas). If you connected a dongle with the bias tee on to a DC shorted antenna you would short circuit the 5V bias tee. Over on his blog Adam shows that a solution is to create a simple DC block component. A DC block component is nothing more than a series capacitor. However Adam points out some important tips including the need to use a small 0603 sized SMD capacitor with 100pF of capacitance in order to ensure operation over the entire frequency range that the RTL-SDR covers. SMA female antenna port – Most dongles use the less common MCX or PAL antenna ports. Ours use SMA which is much more common so more adapters and antennas are available for it. It is also more durable and has lower insertion losses. R820T2 tuner – More sensitive/lower noise floor than the older R820T tuner. 100% compatible with software for the older R820T. 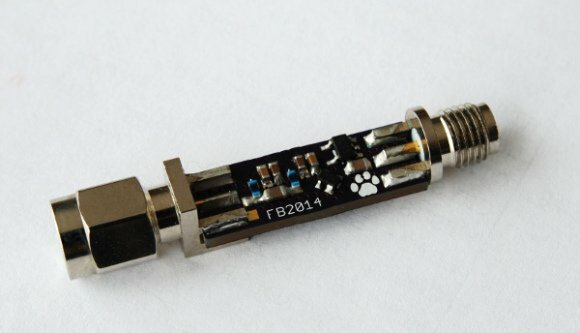 Improved component tolerances – Allows the RTL-SDR to work more optimally over all frequencies. Experimental: 4.5V USB powered bias tee – Can be enabled by soldering two pads on the PCB together. This allows the RTL-SDR to power LNA’s (like the LNA4ALL and HABAMP) and active antennas through the coax cable. Experimental: Break out pads for direct sampling – Allows easier soldering to pins 4 & 5 on the RTL2832U for enabling the direct sampling mod. See our products page to purchase these items! For US customers we highly recommend that you buy from our Amazon store as if you spend over $35 you will receive free shipping from a local Amazon warehouse. This usually takes less than 1 week for delivery. Prime subscribers can also get free 2 day shipping if bought on Amazon. If you like you can also use our international cart to buy from our Chinese warehouse with free shipping. International customers can get free shipping from our warehouse in China. We will always try to use the fastest tracked air mail shipping method available to us, which will be ePacket, EMS air mail or similar if possible. This should get the parcel at your door within 2 weeks, but please note that this time is heavily dependant on the customs and postal agencies within the destination country which we have no control over. Countries such as Italy, Canada, Brazil, Russia and middle eastern countries are known to have extremely slow customs agencies. If you prefer you can also pay more for express shipping and we will use DHL, UPS, FEDEX or EMS Courier. Just use our cart to select the shipping method you prefer. We also kindly remind customers that with international shipping you are responsible for any customs duties or taxes incurred by the shipment. Shipping status meanings: ‘In process’ means that your order information has been sent to the warehouse and the parcel is being packed. A tracking number will follow usually by the next business day. Please note that tracking updates may take a few days to show up. We will provide 6 months warranty on manufacturing defects. Please note that if you try the direct sampling or bias tee mods then any warranty will be voided, so please ensure your dongle is working before trying these. If you suspect a manufacturing fault please email us at [email protected] and include your order number and name. Please include details of the fault and a picture of the fault if it is physical damage. If the unit is faulty we will issue either a refund or send a new unit out depending on your preference. 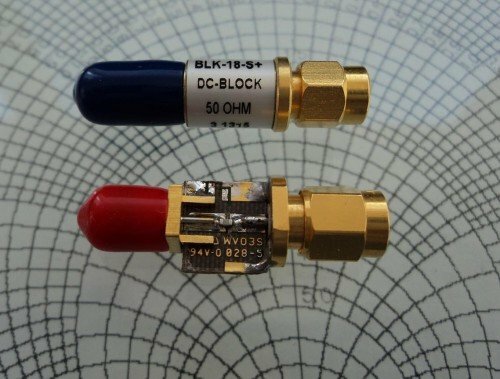 The 28.8 MHz oscillator used in most RTL-SDRs is passive and not frequency accurate. This means that when you tune to a known frequency, it will likely be offset by a few kHz. Usually the PPM offset on a normal RTL-SDR is in the range of 30 – 150 PPM. Furthermore, as the dongle warms up, the frequency will drift up to ~20+ PPM until the temperature stabilizes. The 1 PPM Temperature Compensated Oscillator (TCXO) in our units provides accurate tuning with an initial offset of 2 PPM and a 1 PPM temperature drift over time. This means that a known signal will appear where it should on the frequency spectrum and will not significantly drift in frequency as the dongle warms up. On standard RTL-SDR’s the antenna port is either a MCX or PAL connector. MCX connectors are relatively uncommon and are susceptible to connector strain when using an adapter. PAL connectors are common with some TV connections, but no decent radio or antenna will use PAL due to its high insertion losses above ~100 MHz. We’ve made these RTL-SDR dongles with SMA female antenna connectors. SMA is a very common connector in the radio field and provides a sturdy and secure connection. In addition SMA antenna adapters are much easier to find and insertion losses are lower. We know some people prefer the F-type connector used in the previously sold ThumbNet dongles, but from our previous polling we believe the majority (~80%) of users prefer SMA. We may bring out F-type RTL-SDR’s again in the future if there is demand. Note: Remember to not get confused between RP-SMA and SMA! RP-SMA or “reverse polarity SMA” is used for WiFi equipment only. In the normal radio world, most devices use standard SMA. RP-SMA is reversed, it has the male pin on the female connector, and the female hole on the male end. To be clear: This device is a radio device so it uses normal SMA connectors. As discussed when we brought out our previous generation, the R820T2 tuner has slightly better sensitivity than the R820T and also works better at frequencies around 1.5 GHz. It also works better with the experimental HF drivers. We have these units manufactured with tighter tolerances on all passive components. In our $24.95 USD package we provide two telescopic antennas. The smaller one goes from 6 cm to 20 cm, and the larger one goes from 20 cm to 1.5 m. The antenna base is also larger with a 4.5 cm diameter, when compared to the smaller bases shipped with most models. This provides more stable operation when using the larger antenna. With antennas, usually the larger the antenna is the lower the frequency it can receive. 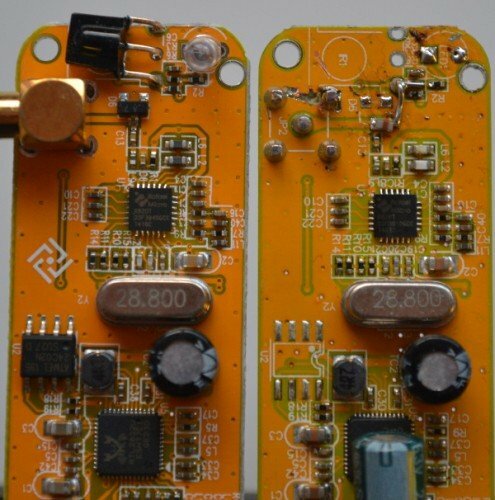 These two antennas allow you to tune to almost the entire range of the RTL-SDR. Of course the antenna should be placed outdoors and up as high as possible to get the best performance. Placing the magnetic mount on a metal surface can also help complete the antenna as a quarter wave ground plane. When fully collapsed the small antenna works decently at 1090 MHz for ADS-B frequencies. A bias tee allows you to power external RF devices such as Low Noise Amplifiers (LNA’s) and active antennas through the coax cable. Since LNA’s should be placed right after the antenna, it can be sometimes hard to get power to them if a bias tee isn’t used. We have included a simple (experimental) bias tee option in our latest units, inspired by mods made by other experimenters. The bias tee is disconnected by default, but it can be activated by soldering two pads together on the PCB. Connecting the pads connects the antenna output to the USB 5V rail. The resistance in the fuse and inductor can reduce the output voltage to about 4.5V. The USB power rail is protected from over current and shorts through a PTC resettable fuse with a hold current of 80 mA and trip current of 200 mA. This means that the fuse will become a short circuit if greater than 200 mA tries to flow through it, which may happen during a short or with faulty equipment. Between 80 mA and 200 mA is an unknown state, where the fuse may or may not trip, depending on the temperature. In practice we’ve tested it with a hold current of 120 mA in a ~16 degree ambient environment (and much hotter inside the dongle casing) and had no issues with premature tripping. We used a 4.7 uH 250 MHz SRF inductor as the bias tee choke. At the highest frequency tunable by the RTL-SDR (~1700 MHz) this should only give a (simulated) ~1-2 dB loss through the inductor. For better performance at frequencies above 1 GHz you could experiment with a smaller value inductor and possibly with removing the static protection diode, though in our tests we saw very little difference with the diode removed. We have tested the bias tee with an LNA4ALL and HABAMP both in bias tee mode. Both worked fine running for a number of hours. The HABAMP really improved ADS-B reception a lot and we highly recommend it. We also tested the unit with two LNA’s connected together, both powered by the bias tee and this also worked fine. An LNA like the LNA4ALL draws about 60 mA of current, so running two at once is pushing the hold current of 80mA on the fuse, but we had no trouble with about 120 mA of current, though we need to note that people in hot climates may have different results as the trip current reduces with higher temperatures. We also tested an active GPS antenna (active antennas contain built in LNA’s) which also worked. With the bias tee and LNA’s we were able to improve weak signal reception and also receive several signals not usually receivable by the RTL-SDR alone such as L-band satellites like Inmarsat, GPS and Iridium with an appropriate antenna. 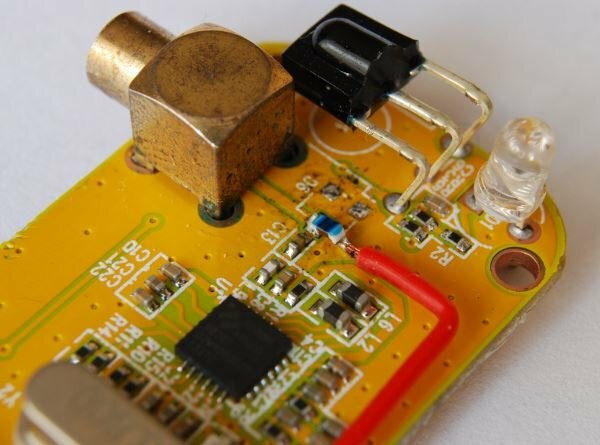 The direct sampling mod is a hardware modification that allows you to tune to HF frequencies with an RTL-SDR. The best way to apply this mod is to directly solder your antenna or matching transformer to pins 4 & 5 of the RTL2832U chip. However, these pins are very small and so the mod requires extreme soldering ability. These units have break out pads for these pins which make soldering to them much easier. Let us know if you have any questions about these units, or feature requests for future units. We’ve tried to make the most popular changes that don’t increase the cost too much, but we are always open to ideas for future improvements. Recently a reader named Fabio wrote in to let us know about his new Low Noise Amplifier (LNA) design for the RTL-SDR. Fabio writes that his design is similar to the LNA4ALL, but is small enough to fit inline with an antenna. An LNA can help improve reception especially if you have long runs of coax cable between the antenna and RTL-SDR. Fabio’s design requires that the LNA be powered inline with a bias-tee power injector circuit which can be easily built from an inductor and capacitor. But instead of building an external bias-tee he modified the RTL-SDR dongle itself to provide the required 5V output power from the USB bus. He writes that with this modification the RTL-SDR could also be used to power an active antenna. Fabio has also released his circuit designs on his GitHub page for free.